Registering a domain name for my blog was easy enough. I only spent 15 minutes doing it. I wrote about why I wanted my own domain, how I got it & tips on what to look out for. The problem is I wanted Blogger to continue to host my blog because it is not making any money. It would be unsustainable to pay for private hosting for my blog. Thankfully, Blogger is generous & has provided instructions to set up a custom domain. It was basically Greek to me because there were plenty of technical terms I was not familiar with. Also, there were no pictures at all to guide me. It took me 1 hour of trial & error to figure it out & get things running. I wrote this guide so that you will be able to do it on your own with the aid of visuals. 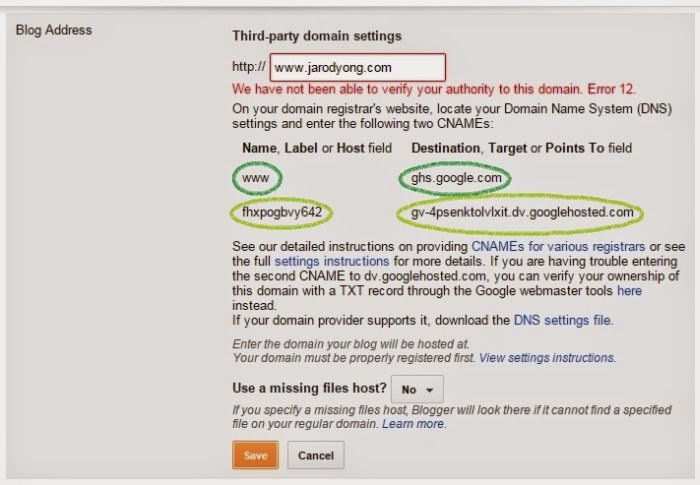 How Do I Use My Custom Domain Name On Blogger? 1. Go to your Blog's "Settings". Go to "Basic". 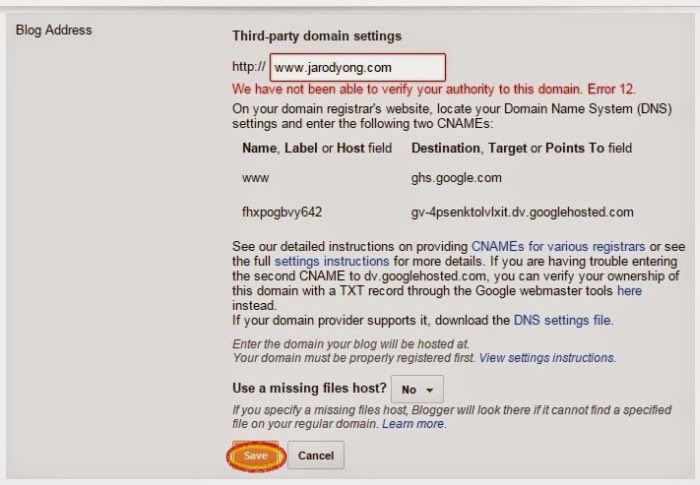 Click on "Set up a third-party URL for your blog". 2. Key in your custom domain name with the "www." prefix. Save & expect an error to show up. This is how Blogger asks you to verify that you actually own the domain name. Take note of the 2 sets of CNAMEs indicated with dark & light green. The second CNAME is specifically generated so yours will be different from mine. 3. Leave Blogger alone (don't close it) &, in a new tab, login to your domain provider's account & go to the "Manage Domains" page. NOTE: I registered my domain with Cynet because I found them to be amongst the cheapest & yet able to provide an extremely reliable service. My guide will be based on the Cynet User Interface. Your provider will have a similar UI. Just follow the technical terms. Click "Manage" & it will load the "Domain Panel" in another tab. 4. 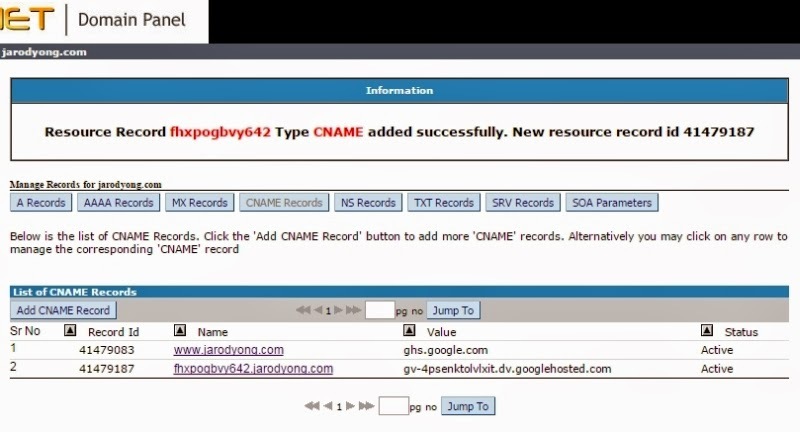 Click "CNAME Records" & "Add CNAME Record". 5. One at a time, add both CNAMEs provided by Blogger. The CNAME indicated in purple is specifically generated for you. Be sure to use the one Blogger generated for you & not the one shown above. This is what you should see when you are done. 6. In order for people to be able to load your page even though they don't use the "www." prefix, go to "A Records". 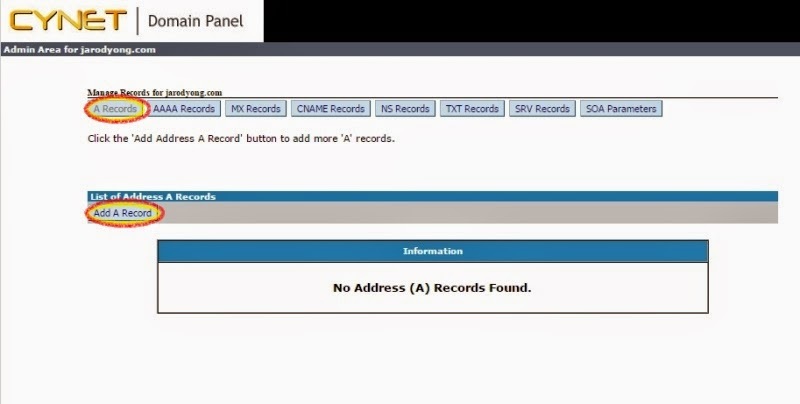 Click "Add A Record". 7. One at a time add all 4 A Records. 8. Your domain is now set to be used with Blogger! Go back to the Blogger tab & save. Note: You might still get an error at this point. Wait for around 1 hour while the DNS servers update themselves about the existence of your domain & try again. 9. Your blog is now set to use your custom Domain Name. Finally, click "Edit" & enable the redirect setting. Congratulations!! You've got your own custom domain on Blogger!! If you're going to privately host your website one day, remember me. I'll get a 10% commission which will go towards the annual renewal of my domain name. Hopefully, I'll be able to get at least RM50 every year to pay for my domain+privacy protection). Also, my code will not give you a discount if you only want to register a domain.